Description: The ranch has four ponds containing rainbows, browns, and Donaldson Steelheads, some of which approach ten pounds. The property has several cabins, and offers many additional recreational opportunities. 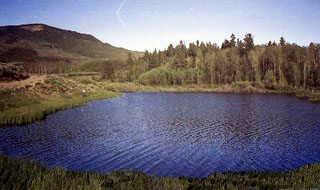 Location: The property is located four miles north of Rand, approximately three hours from Denver. Capacity: Limited to 4 anglers. To make a reservation call 303-421-6239 or 1-800-524-1814.